Lacrosse team royalty vs lacrosse coach royalty. East Coast vs [as close as we’ll get to] West Coast. Tewaaraton finalist Trevor Baptiste vs Tewaaraton finalist Matt Rambo. Dark red vs bright red. There really are a lot of ways that you can choose to frame this game. And whichever gets you most excited about our 2nd semifinal works for me. This matchup pits a fan base that has been tantalizing close to a title so many times against a fan base that tasted glory only two years ago (or in March if you want to count other sports). The story lines in this one are many. And thanks to Coach Tierney, it has a lot of the trappings of an old-world lacrosse battle. This is a stark contrast to our other semifinal, which feels more like a get-to-know-you mixer. Lots to be excited about here. Programming note: this game will be broadcast on ESPN2 at 2:30 ET on Saturday afternoon. Did you really think I was going to make a prediction? 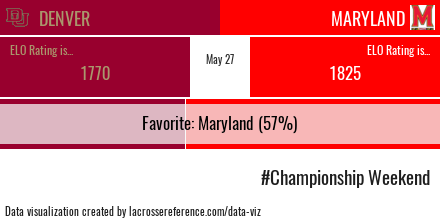 Our Lax-ELO model gives Maryland the extra credit for a gauntlet of a schedule. It thinks that the Terps are the favorite 57/43. Which of course, is well within the margin of error for a single game. So this one is really in toss-up territory. And if you needed any more convincing, just look at what happened with the Terps last week. Everyone thought we’d have a fantastic round II matchup against the Great Danes. And everyone was wrong. The Terps boast the 6th most efficient offense in the country, scoring on 33.9% of their possessions. 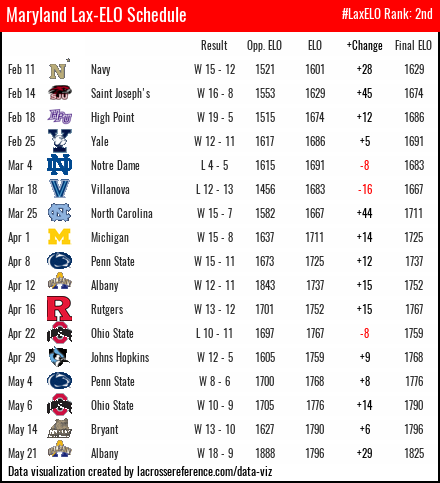 The defense is top 20 (19th overall), limiting opponents to goals on 25.3% of their possessions. In terms of pace, the Terps are true to their namesake, ranking 46th in first shot timing, at 42.5 seconds. The Pioneers, like Towson in our other matchup, are more one-sided. Their defense comes in ranked 50th in the country, allowing goals on 28.7% of their possessions (they were 57th before they throttled Notre Dame last weekend). But that offense… It’s the #1 ranked unit in the country, scoring on 35.7% of their offensive possessions. It has not been a quick-strike offense though. The Pioneers have taken an average of 44.5 seconds to launch their first shot of a possession. That puts them 57th in the country. It would not be a Pioneers preview without mentioning that face-off game. Trevor Baptiste has led Denver to a 73% face-off winning percentage. The Terps have used several players, and are winning 50% of their face-offs. What should we be watching out for? But you didn’t come here just to have numbers regurgitated at you. You came because we are your guides to the game within the game. You want to understand the tailwinds and headwinds pushing each unit toward or away from advancing to Monday. So what do we have for you on that front? As we’ve discussed several times on this site, the importance of face-offs can and should be broken down into its component parts. There is the possession advantage that strong face-off play yields. The second aspect is the offense’s ability to convert face-offs into goals. Undeniably, the possession advantage is a bigger deal. But whether or not those extra possessions become goals can have a huge impact on the outcome as well. Your guess is as good as mine why that may be the case, but Denver’s #1 ranked offense is driven by their play on possessions that start with a face-off win. Because they win so many face-offs, that means their overall offensive efficiency is sky-high as well. Denver scores on 43% of their possessions that begin with a face-off. Maryland allows goals on only 25% of those possessions. Whether the actual number is closer to Denver’s average or Maryland’s average will be one of the biggest factors affecting the outcome. Terps fans may not want to hear this, but my hunch is that Baptiste and this offense are going to get theirs. What happens if the pace does quicken? Both of these teams have played at a turtle’s pace this year (pun intended). By looking at the time a team takes before launching a first shot of each possession, we can get a sense for how they approach pacing. Maryland has taken an average of 42.5 seconds this year, good for 46th nationally. Denver has been slower, taking an average of 44.5 seconds (57th nationally). For Denver, the combination of deliberate, probing offense with Baptiste’s sky-high win rate is a big part of how they ended up #1 overall in time-of-possession. But a slow team can be forced to play faster, usually because of a deficit. And for teams that prefer to play slow, speeding up brings all the negatives that leaving your comfort zone can bring. So in this game, should one team or the other be forced into a quicker pace, who benefits? One way to approach this is to plot each game for both teams with pace on one axis and efficiency on the other. That would help you see whether either team has a noticeable correlation between faster play and offensive output. Another way to think about it is to simply bucket all possessions by duration and then measure the offensive output in each bucket. Taking this approach does yield some contrast between the two teams. 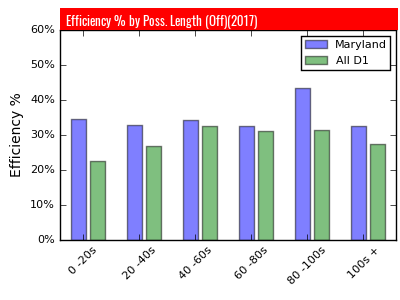 The main takeaway, as you can see in the below charts is that Rambo, Kelly, and the rest of the Maryland unit has been more consistent on offense even as possession lengths have decreased. 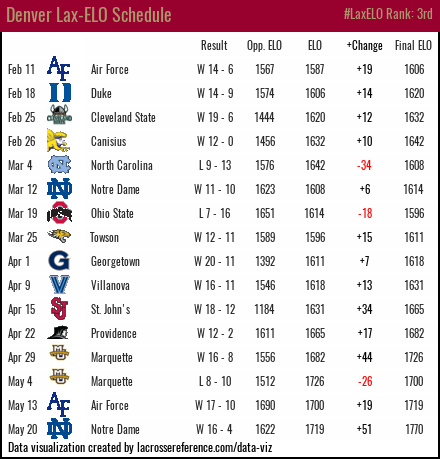 Denver has more or less followed the trend of the average D1 team. 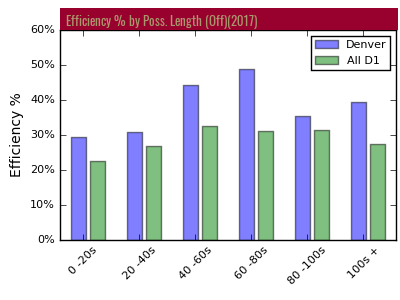 So while Denver’s offense has been better overall, if the game devolves into a back-and-forth pace, the Terps have actually been more efficient on offense. Or put another way, if one team is forced to push the pace to make up a deficit, Maryland is the one that is more likely to be successful. Denver, are they too star-reliant? A lot of ink has been spilled about Trevor Baptiste, and he is truly a once-in-a-lifetime FOGO. His win-rate means that Denver is almost certainly going to win the possession battle in this game, which means that they’ll be able to keep feeding that vaunted offensive attack. And it will force the Maryland defense to be better and will put extra pressure on the Terps offense to make the most of their chances. In terms of storyline, I think that you’d agree that’s the dominant one. The scary thing if you are a Denver fan? That’s almost exactly the same storyline heading into the Albany Maryland game. And that didn’t turn out very well for Albany. This is another area where it’s hard to separate out the game results from any sort of team skill. But let’s assume that Maryland does have a game plan or ability to limit a team’s stars, effectively forcing the supporting cast to beat them. If that it is the case, it might even have a bigger impact against the Pioneers than it did against Albany. 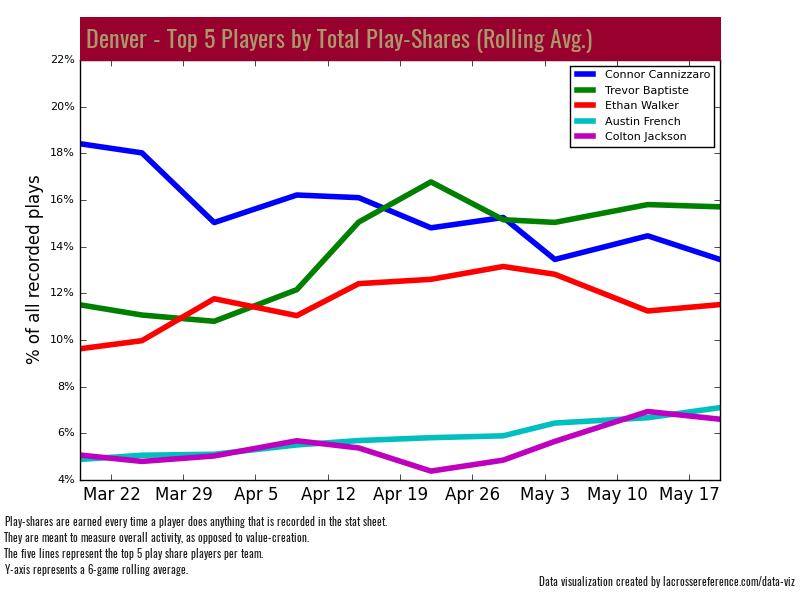 The above chart shows the percentage of all recorded plays for the top 5 Denver players. We can see that Baptiste comes in top, with just under 16% of all Pioneers recorded plays. Then Cannizzaro, then Walker, French, and Jackson. The important thing with this chart is that Denver is more top-heavy than Albany was. Connor Fields ended the year with only 13% of Albany’s recorded plays and after that, Justin Reh was next with just 8%. Granted, a high play-share from a FOGO means something different than a high play-share from an attackman, but to the degree that it indicates a top-heavy contribution pattern for Denver, it’s interesting. Now all of this depends on the assumption that Maryland has some capability for neutralizing an opponent’s star players, which may or may not be true. But I have a hunch that the Denver supporting cast is going to play a big role in this one.